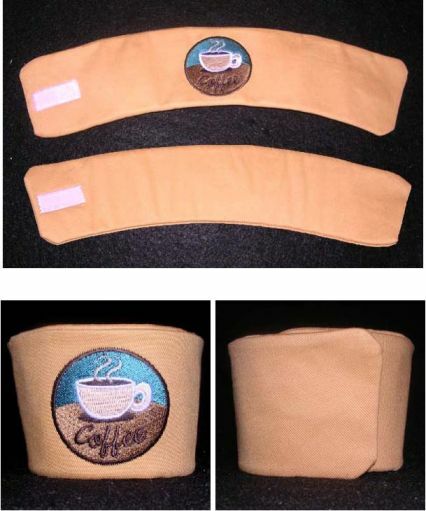 Print the Coffee Wrap Template.pdf file here and use this to cut the applique pieces & Velcro. Step 1: Hoop 1 piece of tearaway backing. Sew the color stop. 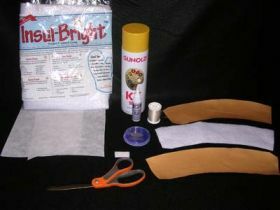 Step 2: Using the spray adhesive, spray the back of the applique fabric that will be on the inside of the wrap. Turn it over and place it within the dielines. Step 3: Sew the next color stop that will tackdown the fabric and placement line for the bottom Velcro piece. Spray the back of the bottom Velcro piece with adhesive & then place the Velcro in the rectangle dieline. Step 4: Sew the next color stop which will tackdown the Velcro piece. Remove the hoop from the machine and remove the design from the hoop. Step 5: Cut away the tearaway backing and set the applique piece aside for now. Hoop 1 piece of tearaway backing and place hoop back on the machine. Step 6: Sew the next color stop. Using the spray adhesive, spray the back of the applique fabric that will be on the outside / front of the wrap. Step 7: Place the applique fabric piece face up. Sew the next color stop that will tackdown the fabric and sew the Velcro dieline. Step 8: Spray the back of the top Velcro piece with adhesive & then place the Velcro in the rectangle dieline. Start the machine again and sew until the machine comes to the second to last stop. Step 9: Using the spray adhesive, spray the back of the inside applique fabric. Place the quilting fabric onto the back of the applique piece you have just sprayed. Step 10: Turn the inside applique piece face up and run a line of fabric glue along the edge of the fabric. Place the applique piece on top of the wrap in the hoop. The wrap fabric pieces should be right side to right side. Step 11: Embroider the last color stop. Remove the hoop from the machine and then remove the wrap from the hoop. Step 12: Cut away the backing and turn the wrap inside out. 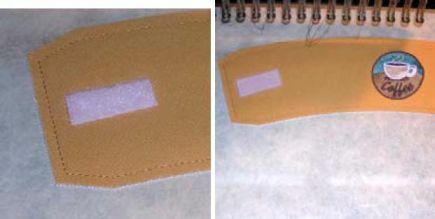 Step 13: Using a hand needle and thread that matches the fabric sew the open end closed. 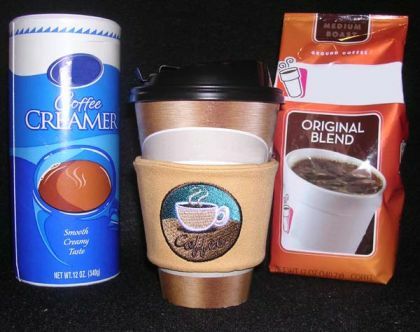 Enjoy Your Coffee! Download above project instructions here.